This might be the most interesting – and shocking – workout study ever. Canadian researchers at Queen’s University tested a Bodyweight Finisher style workout against long cardio. 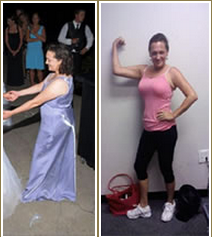 22 college-aged women did 4 workouts per week for 4 weeks in one of three groups. Group B did 8 rounds of 20 seconds of a single exercise (burpees, jumping jacks, mountain climbers, or squat thrusts) with 10 seconds of rest between rounds. Both training groups increased their aerobic fitness levels by the SAME amount (about 7-8%). That’s right, the short bodyweight finisher workouts (of 4 minutes) worked just as well as 30 minutes of cardio. BUT…only Group B, the Bodyweight Finishers style training, also increased muscular endurance in common exercises like chest presses, leg extensions, sit-ups, and push-ups. And finally, the Bodyweight Finishers style training used by Group B also resulted in greater overall workout enjoyment. The Canadian Scientists concluded that “extremely low volume bodyweight interval-style training” will boost cardiovascular fitness just as well as cardio while giving you BETTER improvements in muscle endurance. All in just 4 minutes. P.S. There is NO RISK at all for you to try this Metabolic Finisher program. 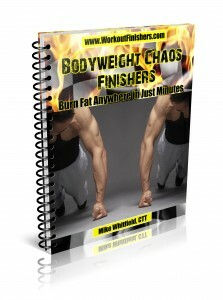 If you are not thrilled with Bodyweight Chaos Finishers in 60 days, let us know and we’ll refund every penny. Your satisfaction is 100% guaranteed. My workout programs have already been seen on Men’s Health, Turbulence Training and used by thousands of men and women, and I guarantee it will work for you, too.